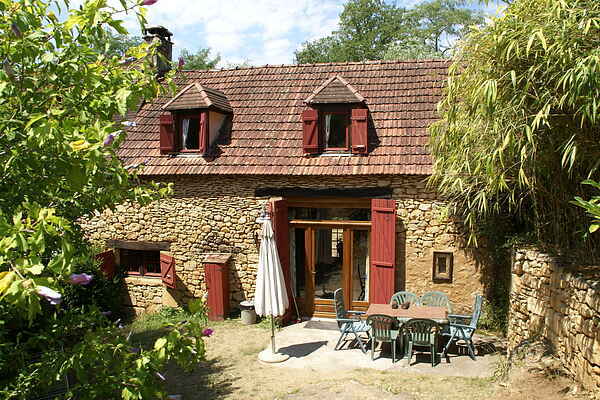 This lovely, attached house is located in the woods of Domaine de Font Vayssière near Saint-Cirq-Madelon (3 km). The wood-burning stove in the living room, the two terraces (the one at the back is covered), the views across the lush grounds and the stone barbecue all make this house a true paradise. The children can play to their hearts' content in this area, on the large playground filled with climbing equipment, slides, swings, a table table tennis table, jeu-de-boules and a volleyball net. There are four bicycles (two with a child seat) that can be rented for a small fee. There are many wonderful places to visit in the surrounding area. A number of magnificent châteaux and towns such as Domme (12 km), Sarlat-la-Canéda (20 km) and La Roque-Gageac (20 km) are located along the Dordogne river. You could also choose to enjoy a more active holiday. The Dordogne is perfectly suited for canoeing. Getting out and about on a bike is also recommended. The Groléjac swimming lake (5 km) is fun for the kids. A little further along are the historic caves of Cougnac (8 km). Rocamodaur (38 km) with the eagle rock and the monkey forest is a perfect day out for the kids, as is the Prehistoparc at Tursac (43 km).